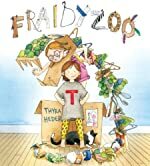 Review: If your looking for a book that little kids would enjoy then the book Fraidyzoo by Thyra Heder is a perfect choice. In this book there is a little girl named Little T and there is an older girl. In Fraidyzoo Little T is scared to go to the zoo but the older girl REALLY wants to go to. When they do go, it's not the little girl that's afraid; it's the older girl. Fraidyzoo is a good book for children ages 4-6. They would like this book because of how the words are written the words are written like a little kid would write it so it would be easy for them to read. There is not much characterization so kids can better understand what is going on. There are only a few words per page so it is a short and easy book to read for little kids. Most of the sentences are questions and they are short. For example WAKE UP, LITTLE T! The lesson taught is that to never be afraid of something before you try it. A girl or boy would enjoy Fraidyzoo because it is not completely girly or boyish. There are things boys and girls would both like. Because the book is about a zoo little kids would be interested because little kids love animals. So if you have a little kid at home you should buy this book. We would like to thank Abrams Books for providing a copy of FRAIDYZOO for this review. Have you read FRAIDYZOO? How would you rate it?